Stuart Dean is proud to have worked with Gaslamp Plaza Suites to restore the Carrara marble walls in their historic 10-story Chicago-style building. Designed for Nathan Watts in 1913 by architects Bristow & Lyman of San Diego it has been known over time as the Watts Building, Robinson Building, the Gaslamp Plaza and Jewelers Exchange and, in its most recent incarnation, as the Gaslamp Plaza Suites. One of the first high-rise buildings in San Diego, it is listed on the National Register of Historic Places and is part of the larger Gaslamp Quarter Historic District. While ‘young’ when compared to cities on the east coast, San Diego treasures its history and architecture. Stuart Dean and Gaslamp Plaza Suites teamed up in late 2017 to plan the restoration of this historic building. 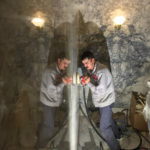 General manager Madeleine Kershaw and chief engineer Gustavo Araiza knew the historical value their building offered the community and had visions of restoring the original Carrara marble and bronze finishes to further highlight this value. After many discussions and aesthetic considerations, Stuart Dean and the Gaslamp team developed a plan of action to restore all of the marble and bronze from the lower lobby to the mezzanine level. 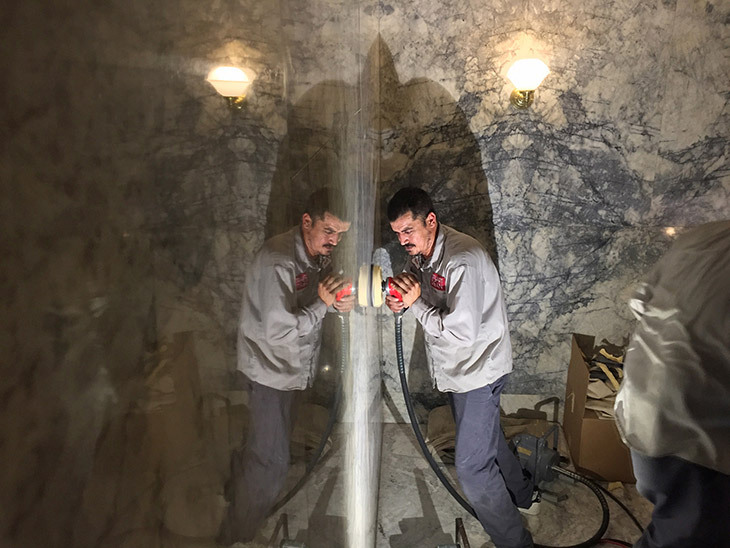 Senior foreman Victor Pinuelaz works his magic on the Carrara Marble walls at Gas Lamp Plaza Suites. The polished marble walls in three lobbies and through two sets of staircases totaled approximately 2,500 square feet. Access required the construction of steel scaffolding in the staircases and a scaffold tower in the center of the staircase to access the marble paneling on the exterior of the staircases. Before cleaning, the 105-year-old once-lustrous Carrara marble could easily have been mistaken for a lesser-quality honed or matte finished marble. Stuart Dean’s artisans restored the stone to its original, architect-specified, high-gloss finish. Today, the Carrara marble shines, like it did when horse-drawn wagons shared the road with Model-T Fords. Not only does the marble sparkle again, Stuart Dean managed to dramatically reduce, and in many cases eliminate, the pervasive yellowing caused by natural oxidation and environmental pollution – without the use of caustic chemicals. Stuart Dean has restored and maintained architectural surfaces since 1932. As a national leader in building restoration and maintenance we are dedicated to working with vendors and partners to develop green initiatives to ensure environmentally conscious solutions in the restoration and maintenance of architectural surfaces. BBC News: The Taj Mahal is changing color. Download Stuart Dean’s white paper on Historic Preservation here. The National Register of Historic Places, established as part of the National Historical Preservation Act of 1966, is overseen by the National Park Service. It is a national program to coordinate and support public and private efforts to identify, evaluate, and protect America’s historic and archeological resources. Does being listed on the National Register ensure that a building won’t be torn down? No, as this article on Atlas Obscura explains.